“Well, kinda.” – Russ Poulin, not President and not running for President or I would have had to call people names. I realize I have much less stature than the President, but I was asked last year by the Department to be on a data panel when they began their quest to create (what was then called) the Postsecondary Institutional Ratings System. Several issues were raised by that panel. Some were solved. Many remain. I did not have time for an exhaustive study of the site, but I do have some initial impressions. Some of my questions might be answered with more experience and research. The data is intended to help students make informed college selections. This is a great goal and is much better than their original plan of grading colleges based upon Departmental data sets that were ill-equipped to do so. Institutions respond to student focused info or ratings. Look at how they try to game the U.S. News rankings or those who have already touted their standing in the Scorecard. They focused on a simple, relatively easy-to-understand, mobile-centric layout. The site is easy to navigate and the graphics and pleasing and informative. The data sets are open for others to use and create tools to enhance the site. I enjoyed their “Under the Hood…” revelations of how they created the site, in which they say: “By giving developers access to an API, even more customized tools will be created, providing students more options than ever before to find the right school for them. When students conduct searches, they are given several colleges (often over several pages) from which to choose. Students can click to find even more information about a college that might interest them. There is No Information about Distance Education. You may thing that’s odd coming from me. Thankfully, the old College Scorecard page has been relegated to the “Page Not Found” graveyard. In my testimony last year, I showed how the “Distance Education” option lead you to only those handful of institutions that are fully at-a-distance. Well, sine the vast majority of colleges now have distance education, that leaves out many, many distance education options. Being silent on distance education is better than being so misleading. Colorado – Aims, Front Range, Pueblo, and Otero Community Colleges. Arizona – Rio Salado College. Perhaps I did something wrong, but I searched both by variations on their names and by looking the state lists of colleges. The dreaded first-time, full-time completion rates are used. Why is “Data Not Available”? Why is “Data Not Available” for Some Measures? For some measures for some colleges, the data field is “Data Not Available.” I have good guesses as to why that is. Will the average student? There should be an explanation. Is the Focus on Salaries Good Public Policy? I understand that this is put out by the Department of Education and they want to make sure that students enter fields in which they can repay their loans and make a good living. I’m all for that. But is that the highest and only goal of higher education? Frankly, I’m hoping that we continue to graduate a few social workers, teachers, nurses, and actors. They don’t measure well on this scale. 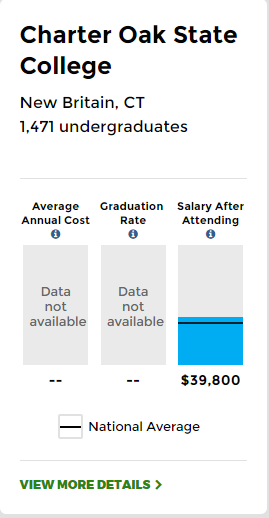 One of the first three charts that appears in the initial search for every college is the “Salary After Attending.” This gives salary great importance. Salaries are compared to a national average, but salaries vary greatly by region. I can understand wanting to make it simple, but is this an over-simplification? Salaries are institution-wide. They may vary greatly by program. I’m not going to say much about these charts they provided, on “30 four-year schools with high graduation rates and low costs” and “Schools with low costs and high incomes.” Williams College on a list of low-cost colleges? That’s interesting. Again, the site seems to be rewarding colleges with highly selective admissions. I’m biased because I don’t really think these colleges need yet another boost. 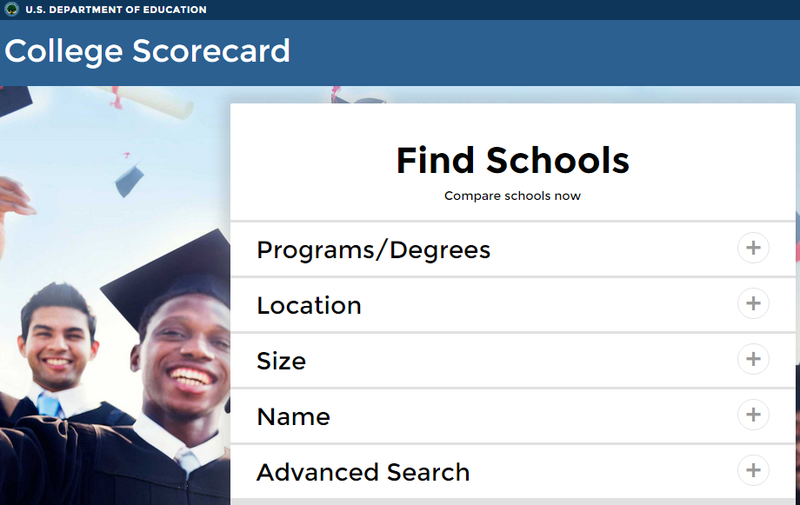 What do you see when you look at College Scorecard? Looks like you are correct. Institutions that granted more certificates than degrees in a year do not appear to be listed. According to the great work by Phil Hill that leaves out 17% of community colleges. That leaves out some major community colleges. In the “The…Ummmm…Not-So-Good” section I think you are being unnecessarily defensive. There is a large number of schools providing an extremely broad range of products. Higher education is not a single market with a single segment. I think you should focus on your market and segments. What’s good and what’s bad? Droning on about the inequities between the schools with huge endowments and everyone else is simply not productive. Harvard and Williams can charge a ridiculous amount and they can afford to offer huge discounts. So what? Don’t waste your limited energy hoping for the world to make sense. It doesn’t and it won’t. Who is your market? What are the segments? How can you serve them to the maximum. Can you get coverage in the NYT or on TV? I don’t know. But if you don’t focus on your challenges then your just wasting time and under serving your market. My complaint was not with those institutions spending their own funds and endowments. You make the point that higher education in not a single market. I agree. I just think it is bad public policy for the Department of Education to advantage one segment over the others, especially when those advantaged are already well-funded. The College Scorecard Help Desk suggests that since the aim is to list predominantly degree-granting 2- and 4-year institutions, if a school crafts a variety of local certificates, and provides more certificates than degrees in a given academic year, the institution doesn’t qualify for the College Scorecard. Instead, the school is categorized as a “predominantly certificate-granting institution” and not listed. That might account for at least some “missing” schools.